If you have an eBay listing subscription package, you can now easily track how many insertions are remaining on your package directly from your Auction123 Dashboard! Located next to the Auction123 Support Live Help link, you can quickly review the number of listings you have available on your eBay package for the month. Hover your mouse over the icon to review additional details including how many listings you’ve used and the expiration date of the remaining insertions you have available. You may have noticed a section within the Item Specifics section called “Seller Notes” on some eBay listings. This area is what eBay calls your “Item Condition Description”. This field is useful to add information that is related to the condition of your vehicle for your shoppers to see immediately upon landing on your ad. Any information you add here should also be included within your listing description. You can now add content to the Seller Notes section from within your Auction123 Dashboard. 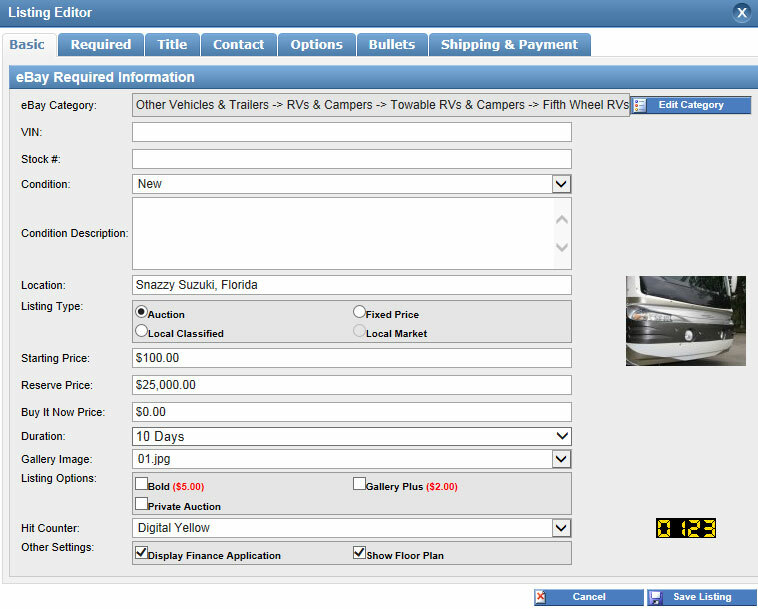 Simply navigate to the Listing Editor and enter the Condition Description of your listing. 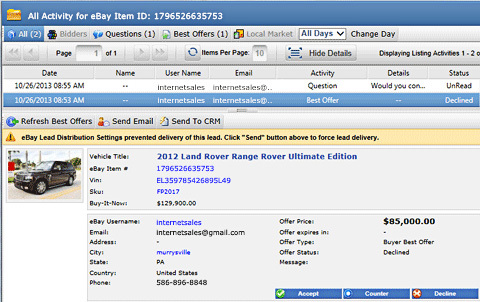 Once your eBay ad is launched, the content you enter in this field will populate on your eBay listing. You are allowed to enter up to 1,000 characters in this space to describe the condition of your vehicle. Be sure to include anything you enter within your listing description as well. Don’t Miss this Only Opportunity this year to learn Directly from eBay!! eBay Motors is hosting an eDealer Training Conference for Select Dealers. You and your management team are invited to attend the best internet training conference of the year! Learn the processes that the top internet dealerships are using to broaden their marketplace and sell more cars. In addition to the training, you will be provided a Dealer Consultant from eBay, an Operations Blueprint for selling vehicles on eBay and up to 30% off eBay listings. The combination of the training, the consulting and the book, has proven to be the absolute best way to improve your success on eBay or get you started off on the right foot. The goal is for you see how to sell on eBay the right way, generate high quality leads with eBay auctions and leverage the benefits of being a franchise dealership on eBay to sell everyday cars. Please Note: This event is designed for your management team.